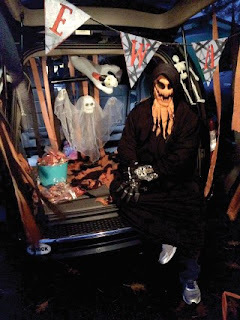 Expect an evening filled with ghoulish and haunted happenings as Windham Parks and Recreation holds its second annual Trunk or Treat Halloween Adventure on Saturday, October 28 at the Windham Middle School from 6 p.m. to 8:30 p.m.
As darkness descends the parking lot, one can expect frightfully decorated car trunks as creepy goblins and ghouls explore the grounds of the middle school, enjoying a cauldron of games, howling music and magical refreshments. All this and much more for families with children who are in the eighth grade or younger. The only “cost” to attend the event is a perishable food item that will be donated to and help support the Windham Food Pantry. While everyone is enjoying the evening, judges will be quietly sneaking around in the background, looking for the most creative and innovative costumes, as well as the most interestingly decorated trunk. For those who wish to participate in the costume contest, one will need to sign up at the judge’s table in order to compete. Music will be provided throughout the evening, while games and crafts will take place at the same time. At 8 p.m. the winners of the costume contest will be announced. For anyone who would like to host their “trunk” for the Trunk and Treat portion of the event which will be available from 6 p.m. to 7 p.m., please register online at www.windhamrecreation.com or at the Parks and Recreation office at 8 School Road in Windham. For more information, contact the Windham Parks and Rec at 892-1905.